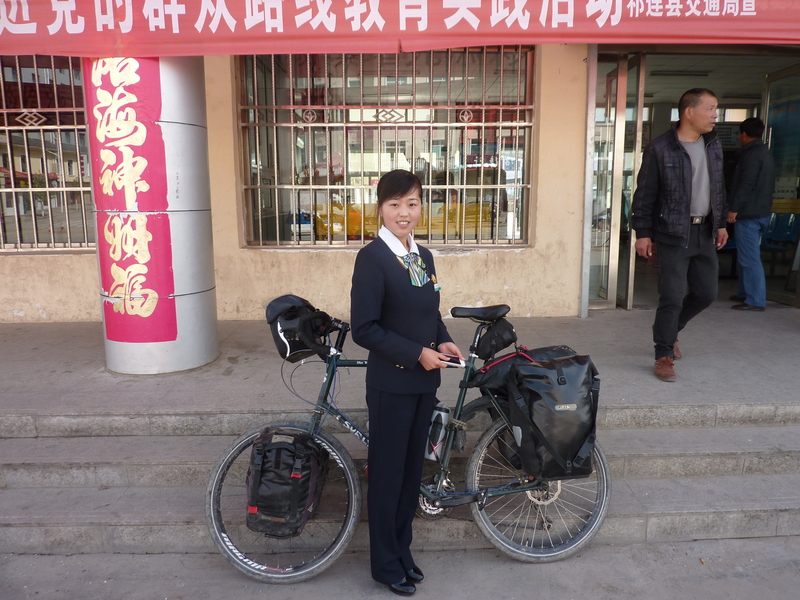 Leaving behind the friendly atmosphere and delicious home-cooked meals of the hostel in Jiayuguan wasn’t easy. But after several days of chatting, sightseeing and gorging, the clock was ticking. 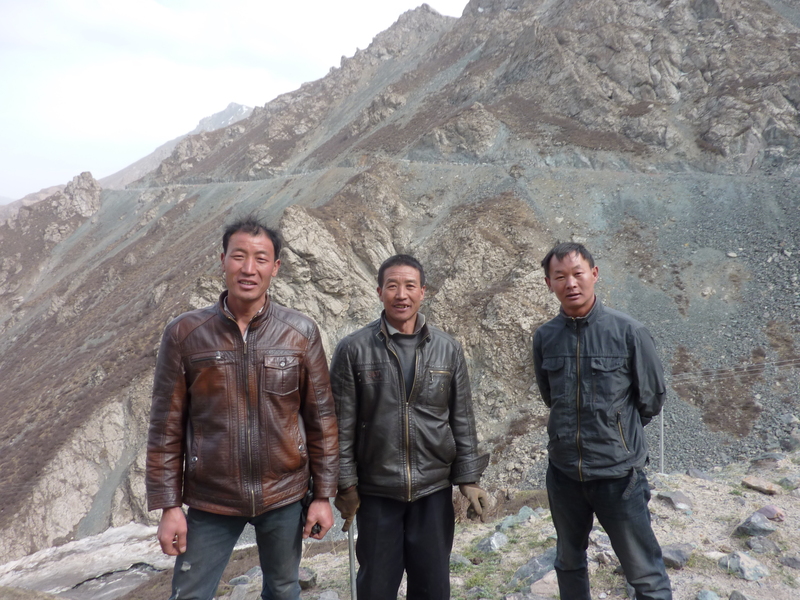 The next logical stepping stone was Zhangye, located further east along the narrow Hexi Corridor. However, rationality soon flew out of the window as the impressive snow-capped peaks of the Qilian Shan began to rise up from the south. 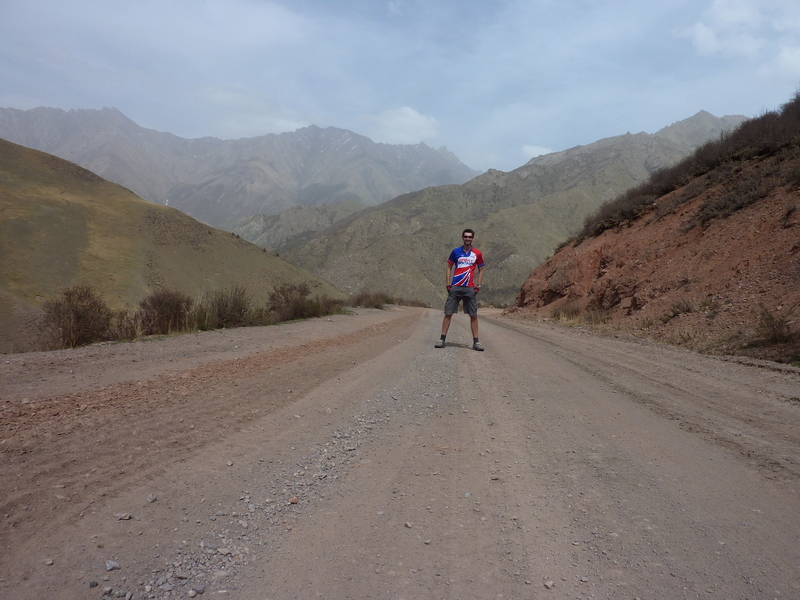 A day of disinterested desert cycling quickly had me convinced and, as soon as was physically possible, I left the barren lands of the corridor behind for the more varied scenery of the mountains. Unfortunately, the dust and haze conspired to deprive me of the undoubtedly stunning views during my first day climbing into the foothills. Despite this, I have rarely enjoyed ascending more as I made my way along quiet roads towards the quiet, but surprisingly shiny, town of Sunan. Sand and scrubland were quickly replaced by pastures and craggy hillsides, as I was reminded that China is not simply one large dust bowl. 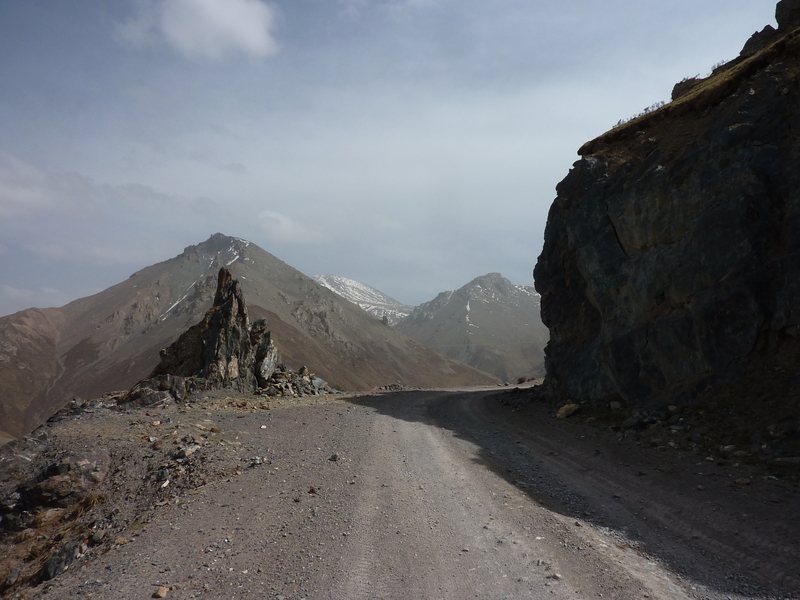 From Sunan I headed further into the Qilian Shan, aware that plenty of climbing lay ahead. Ominously, the road I had opted to take was conspicuously absent from my offline electronic maps. Sure enough, a few kilometres after Sunan, perfect asphalt turned into a rough dirt track. Unfazed by this, I pressed on and began a long climb up towards a pass that I knew lay ahead; although how far ahead and how high it was remained unclear. Completely alone and without a village in sight, I wound my way slowly up the dusty track. Energised by the peaceful atmosphere and breathtaking views, the arduous climbing felt easy. Nevertheless, as the day wore on, I was acutely aware of how lucky it was that I had picked up extra supplies as I left Sunan. Apart from the occasional small-scale mining enterprise or deserted farmhouse, there were few signs of human activity. However, when I was spotted by locals, they were suitably stunned and amused. 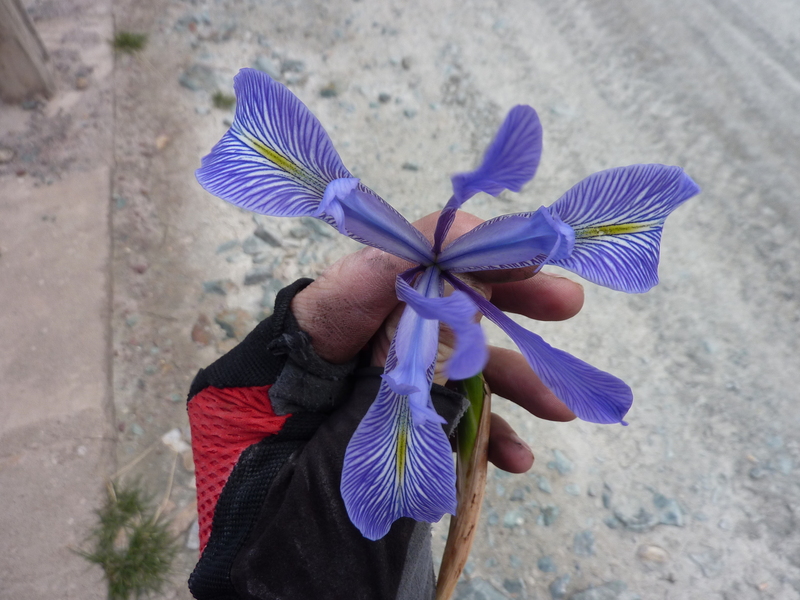 One group of miners were exceptionally friendly and after I had turned down their offer of a lift, they stopped to give me one of the rare mountain lilies(?) 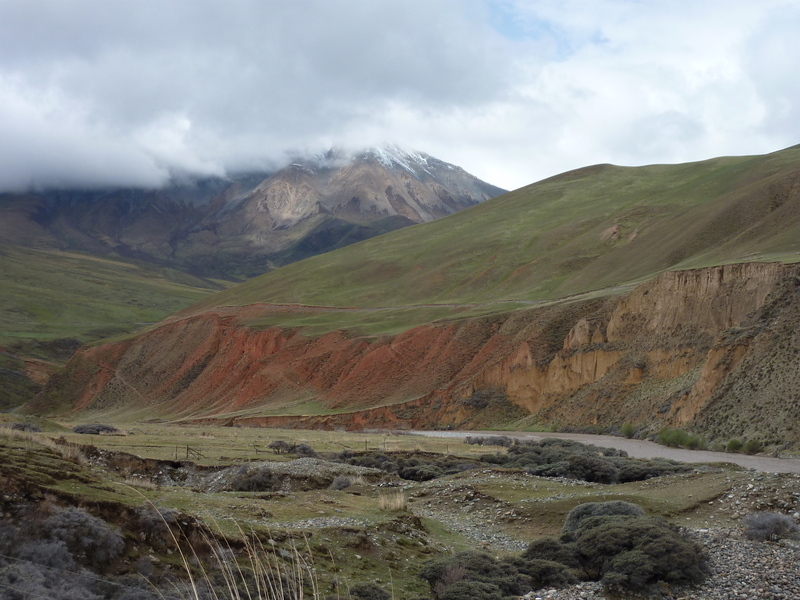 that cling to the dry slopes of the Qilian mountains. Eventually, with the sky beginning to turn grey, a stiff wind lowering the temperature and snow now lining the track, I reached the pass. 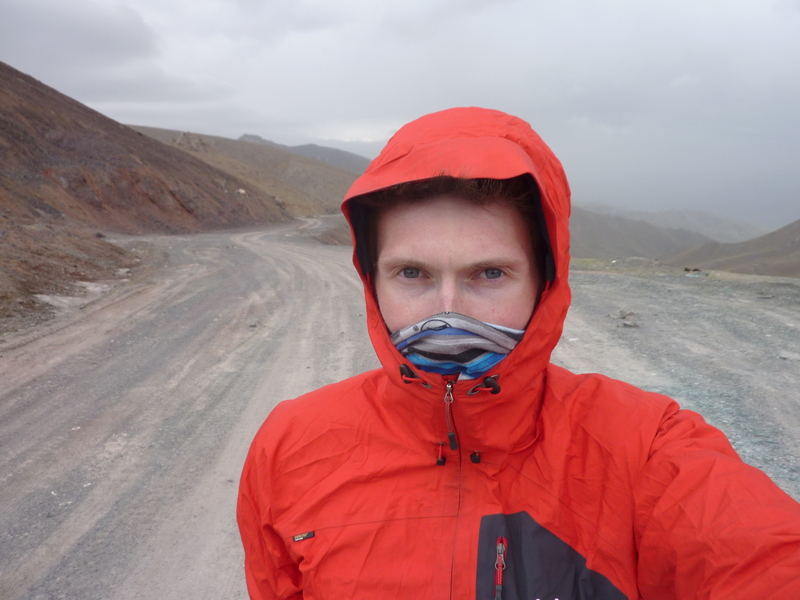 After six hours of cycling and having climbed nearly 1,800 metres, I summited at 6.30pm and crossed into the mountainous region of Qinghai. 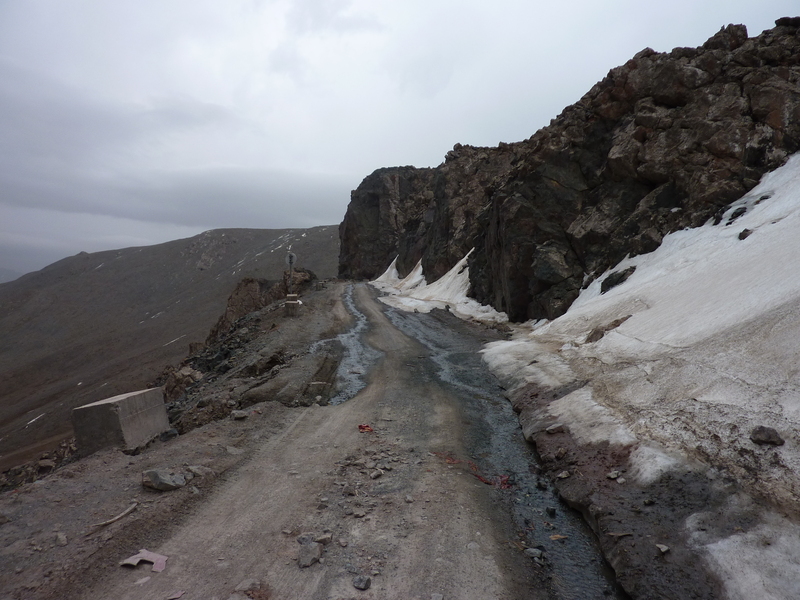 As it turned out, this pass stood at a chilly 4,100 metres and escaping to a more pleasant altitude quickly became a priority. As I began to descend, the ominous-coloured clouds revealed their true intentions and swirling sleet was soon added to the now freezing wind. Within minutes my fingers were so numb inside my gloves that undoing my panniers to put on layers was a frustratingly slow process. As thunder also began to rumble in the distance, I tried my best to scour the bare landscape for any kind of shelter, whilst simultaneously concentrating hard making my way down the treacherous dirt track. Finally, having spotted nothing in the way of shelter, I stumbled across a derelict building that I quickly decided could be my salvation. 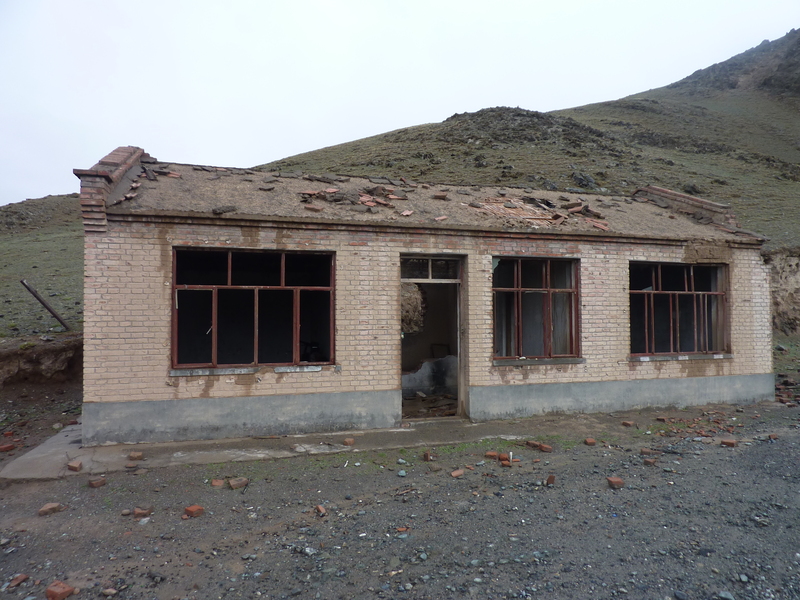 Its sturdy walls and surprisingly intact roof were extremely welcome, saving me from the unpleasant prospect of camping in the midst of a storm at 3,500 metres. As the wind howled outside and rain thrashed against my makeshift home’s creaking roof, I felt like I had just had a very lucky escape. 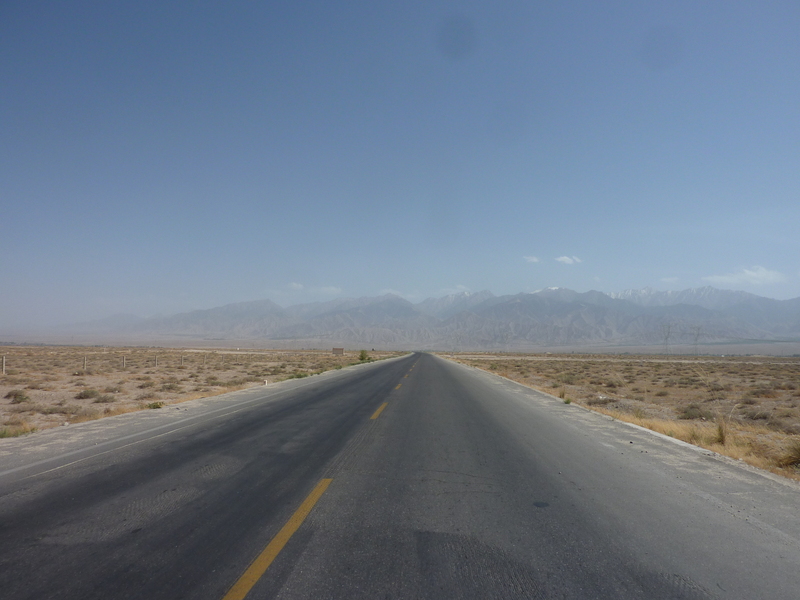 The next morning, the gravel soon became asphalt once more and I started to fly down a spectacular river valley, flanked by impressive peaks, towards the remote town of Qilian. Unbeknownst to me, this town – and possibly also the surrounding area – are closed to foreigners. I did not discover this until after I had left, but it would certainly go some way to explaining people’s reactions to the sight of me. Nonetheless, I had no problem finding a hotel and managed to wander the town at leisure, without being pounced upon by the People’s Security Bureau. Unfortunately, this further good fortune had apparently exhausted my last reserves of luck. One crackly voice mail later and my plans were in tatters. This unwelcome message was from my airline, informing me that the second leg of my flight had changed and that I no longer had the time to transfer in Xian. Calmly, they informed me that the best option was for me to leave a day earlier. 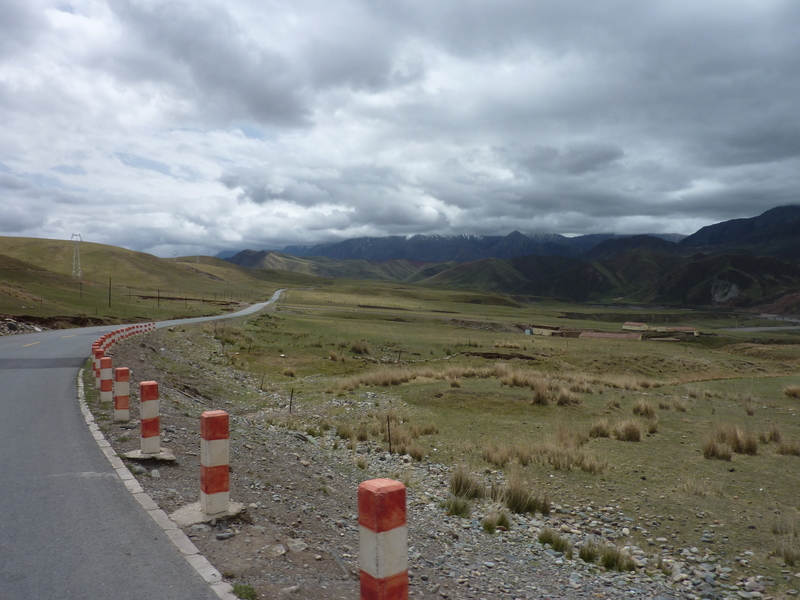 This loss of a day meant that I had to cycle 300 kilometres and cross two 4,000-metre-high passes in two days, if I wanted to be in Xining with time to pack my bike. Furthermore, to contact the airline, I needed WiFi. Either way, it quickly became apparent that taking a bus to Xining was inevitable. However, buses require money. And Qilian was apparently unwilling to provide me with this. Not only was the only international ATM out of order, but the local banks could not change my emergency dollars. Fortunately, my celebrity status ensured the maximum cooperation/curiosity of the local people. Before long, a friendly female bank worker had not only arranged a black market currency exchange, but had also organised my bus journey to Xining. All that was required on my part was a quick selfie* with her. Six painful hours later, I arrived in Xining, the capital of Qinghai and the finishing point for the Chinese leg of my trip. Strangely, despite all the challenges that travelling in China has posed, reaching the end of my time here has kindled feelings of regret, rather than relief. Amidst a flurry of socialising and packing, the past few days have left me feeling that I have barely scratched the surface of this fascinating country. Tomorrow, I fly to Seattle, but to make use of an all-too-American cliché, I’ll be back. *Older readers might want to Google this; it’s perfectly innocent. Great photos. I think the flower is an iris!! Edward just said “rather like doing a 2k on an ergo, only vertically”. We are amazed. Love following your travels Rob, looking forward to what’s next. Great Rob – sounds like you are havng an amazing time – stay safe ! 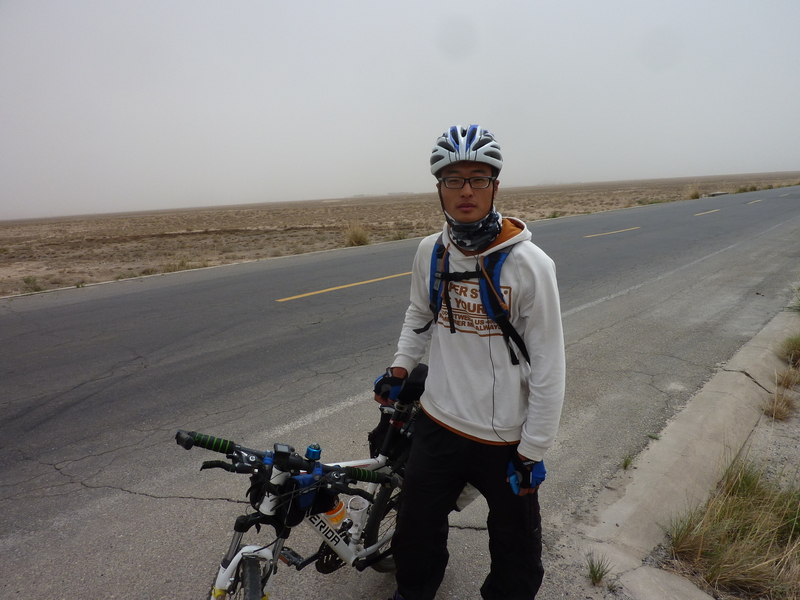 Glad you enjoyed your time in China, amazed that you didn’t get arrested in Qinghai. Eclectic English teacher Chris from Urumqi. Ha ha! I didn’t feel like I was about to be arrested. Captured and put in a zoo, maybe, but not arrested. Hope your time in China is treating you well!